Designed to enable kids to reach their full creative potential, Kids Science Labs (KSL) combines inspiring learning environments, engaging teachers, and a program that offers real science and engineering that is accessible, fun, and innovative for our kids. Our first learning center opened in 2011 and since then over 100,000 students ages 2-12 have experienced our innovative hands-on science program. Kids Science Labs was started by two dads who, as engineers, wanted to solve a problem. Kids are curious and love mixing, designing, and discovering. The problem was that by age 9, kids become convinced science is boring, not relevant, or just too hard. That was a problem we wanted to fix. Our exceptional team of passionate educators, scientists, artists, and innovators are inspiring the next generation of problem solvers through everyday hands-on science. Best of all, we have do it having fun! Kids Science Labs is excited to announce a new location in Roscoe Village at 3330 North Western Avenue Chicago, IL 60618 (Just North of the corner of Belmont and Western). 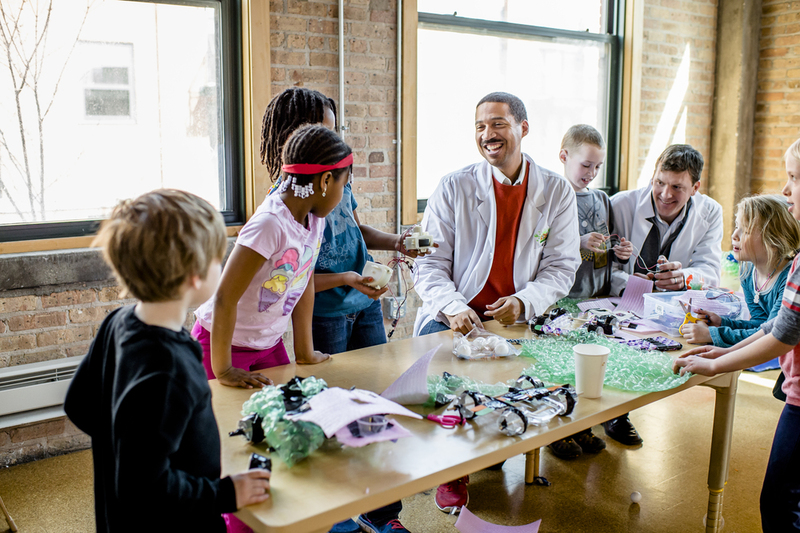 Now families in Lake View, Roscoe Village, Ravenswood, Irving Park, Uptown (to name just a few) can enjoy the World's best hands-on science program for creative design, innovation and problem solving for children ages 2-14. Starting in May 2019, our weekly hands-on science classes, summer and day camps, and birthday parties are now accessible right in your neighborhood. Stay tuned for more updates. Join us for a great summer camp starting this June.